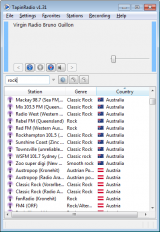 TapinRadio is a Microsoft Windows program that lets you listen to your preferred online radio stations, while also offering advanced recording utilities. The first thing you will notice after starting the program for the first time is the big collection of stations. Organized by region, network and genre, the big list of online radio stations can be further improved with your very own entries. TapinRadio works with the most famous web-based radio formats, including WMA, MP3, OGG, and AAC+, while granting you an advanced recording feature, indifferent of the station you're listening to. The software can automatically record the content and divide it into songs, but it also consists of dedicated features to record a single song. The application provides lots of features and radio stations. The interface is user friendly and easy-to-use. The free version lacks a few features. The Presets menu can be annoying sometimes. TapinRadio has been tested by Download82.com team against viruses, spyware, adware, trojan, backdoors and was found to be 100% clean. Our editors will recheck this software periodically to assure that it remains clean.